Our visit at Recaredo started in the vineyard. It seems only natural because it is the place where everything starts when you make wine. And it makes even more sense in an estate that has put the respect of nature at its top priorities. At Recaredo, things are thought as a whole. Wine growing, winemaking, are processes that are conducted with the same global understanding: the respect of the balance of nature. If you respect nature, you also respect human and vice versa. Therefore, they have started to apply biodynamics. Biodynamics is a way of growing vines and making wines that prone not to add or take away anything. Therefore, no herbicide, no pesticide, no enzyme, no artificial chemical is used. You preserve the flora and fauna in the vineyard and you let things go their way in the cellar (which is easy to do when everything is done properly before). Recaredo vineyard in the foreground. In the background a traditional vineyard where vegetation is killed, probably with the use of herbicides. Following these principle, they have had fantastic results. Some of them were unexpected. For example, vegetation is kept in the vineyard. I still remember my viticulture teachers saying that letting grass grow is a problem in places where the water supply is limited. At Recaredo, they have made the test and the result says otherwise. In the vineyards where grass is kept, the ripening of the grape is slower and the acidity levels are higher because the soil actually keeps better humidity. Drawback? Yes, the yields are a bit lower. But this doesn’t weight a lot, in respect of all the benefits in terms of complexity and balance of the wine obtained. As a result of their choice, the vineyard is full of life and colors. It also seems cooler when you watch in contrast the other, conventionally trained vineyards. The choices of Recaredo go further. 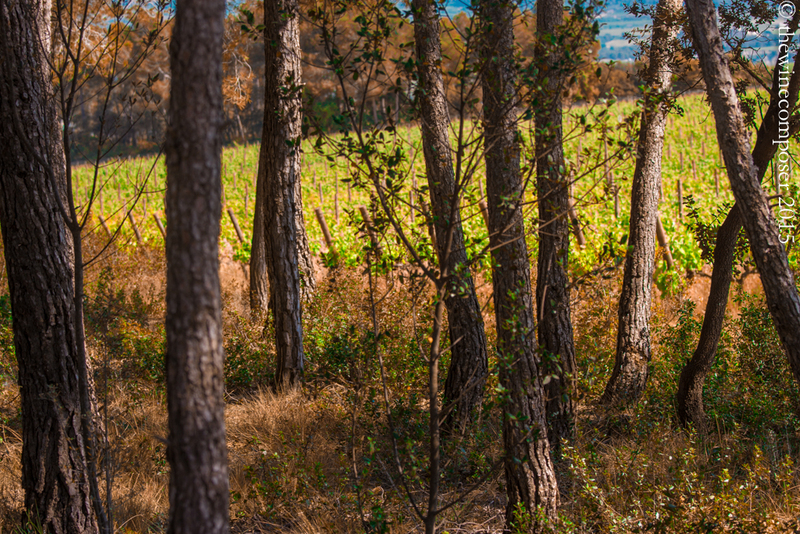 For example, thanks to the size of their main plot, they have been able to keep a forest in the middle of the vineyard which has a very positive impact on temperature and humidity. They are using bats to fight harmful insects. And most unexpected of all, they use, at least in some places, marcotage to replace dead vines. Marcotage is done by burying a branch of a neighbor vine in the soil, which results in new root to grow and quickly a new vine is born. This cannot work in every vineyard but obviously, the soils at Recaredo are not as infested by phylloxera (an insect that kills the ungrafted vine) as in other places. Note, by the way, that I am not particularly an advocate of ungrafted vines but when it is possible to do it, it is always better than poor grafted clones. Regarding the vines, following the idea to respect terroir, they have decided to get rid of international grapes (being Chardonnay and Pinot Noir). Now the entire estate is planted with local grapes: Xarel-lo, Macabeu, Garnacha and Monastrell. Considering the personality of the resulting wine and our project, this has a direct impact, as the wines have a stronger originality. Of course, the grape is always secondary compared to the terroir, but it is a question worth asking: why using international (French) grapes, when you have your own local high quality grapes. Walking in the vineyards tells a lot about the philosophy of Recaredo. There is no better way to understand the wine than seeing where and how it is done. You cannot separate one from the other. Later on, we will see the same reflexion and respect at work in the cellar. The Recaredo team is not the only one to have understood the importance of every single detail, but they definitively are a great example.